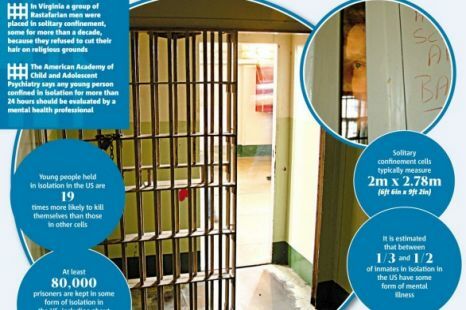 Home » News » Are supermax prisons a necessary evil or a violation of human rights? Are supermax prisons a necessary evil or a violation of human rights? It has been denounced as torture by the United Nations and is virtually unheard of in Britain. But in the US, solitary confinement is widely used, as radical cleric Abu Hamza and four other extradited terror suspects may soon discover. You can count the number of prisoners in England and Wales kept in solitary confinement on the fingers of one hand. In the US, campaigners put the number at 80,000 – men, women and even children. Since the early 1990s, dozens of states across the US have built so-called ‘supermax’ (super-maxium security) jails – large complexes in remote areas specifically to hold prisoners in prolonged and strict solitary confinement. Recently extradited radical cleric Abu Hamza is facing a future in the only federal supermax prison, known as ADX Florence, in Colorado, where inmates spend 23 hours a day in cells measuring just eight square metres, surrounded by thick concrete walls and two doors, one with bars and a second made from solid steel. Supermax inmates may be held for years and even decades with virtually no human contact and this year two men in Louisiana – Herman Wallace and Albert Woodfox – marked the grim milestone of 40 years in solitary confinement. But what is the reality of life in this environment, who is incarcerated there and what are the psychological effects of being deprived of human contact? Criminologist and human rights worker Dr Sharon Shalev, who has visited several supermax jails, told Metro they had a profoundly ‘strange’ atmosphere. ‘The thing that struck me most is they’re very, very quiet,’ she said. ‘They’re very clean. They just don’t feel like places where human beings live. ‘There’s something in the antiseptic feel, the total lack of human contact between prison staff and inmates in the supermax which I think is quite uniquely American and you won’t find in any European prison. It’s a cliché but they treat them like animals. To heighten the sense of powerlessness, prison staff remotely control all aspects of a prisoner’s life, from when their cell’s lights are switched on and off to when the toilet is flushed. 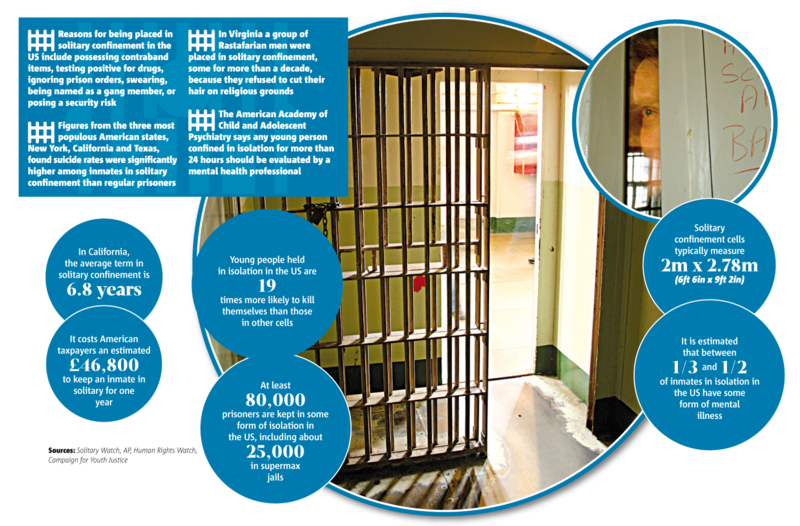 Access to books and magazines varies but many inmates cannot read even if they want to. Dr Shalev said: ‘The tragedy of a lot of people who find themselves in solitary confinement in supermax is that many of them are illiterate. Isolation can cause damage in as little as ten days and Dr Shalev said former solitary confinement inmates she has met are ‘very uneasy’ in social interactions. ‘Returning to reality, intimate relationships, just being around people, is incredibly hard, which is tragic considering that has been what they have missed. They long for human company and then they finally have it they can’t tolerate it. Dr Shalev conceded that some inmates held in supermaxes, who number at least 25,000, are ‘genuinely dangerous’. But she said others were simply ‘gobby prisoners, people who are a pain in the backside basically, annoying prison staff, often because they are cleverer than them’. And, worse, a significant proportion are mentally ill – for whom she said segregation is ‘like putting an asthmatic in a place with little air to breathe’. She added: ‘Staff try to scare you into how dangerous the prisoners are, saying: “Be careful, don’t get too close, they’re unpredictable”, but that wasn’t my experience of the prisoners at all. Dr Shalev said there were simply no equivalent facilities in Europe. Forensic psychologist Ian Stephen witnessed the effects of solitary confinement first hand in Scottish prisons from the 1960s when the practice was more widespread. He said inmates are at risk of psychosis and may develop schizophrenia, start hallucinating and become paranoid. ‘You can also become hyper-sensitive, very aware of noise, changes in routine, everything, and enter an extreme state of traumatisation,’ he said. Although different personality types handle the stress of solitary confinement in different ways, he said it was damaging for both introverts and extroverts. ‘People who make a lot of noise and try to stir things up find it very difficult when they get no response from the prison officers. The isolation affects them deeply. Some inmates ‘never recover’ from the trauma of even a relatively short period of isolation, he added. The Ministry of Justice said data on the number of prisoners in segregation in England and Wales was not centrally collected. A spokesman for the Prison Service said: ‘We do not, and never have, used the term “solitary confinement” to describe the removal of a prisoner from “normal” accommodation.